Repairs are right the FIRST time! Our online reviews tell the story — we offer the best service in Atlanta, with the fastest turn-around. 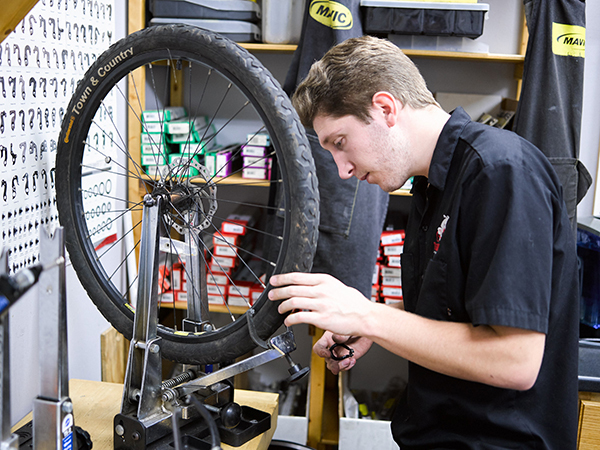 We have all of the specialty tools to repair electronic shifting and overhaul the best mountain bike suspension, while also being happy to install training wheels for your child’s bike. We understand that every rider has different needs and goals. We don’t have the elitist attitude found at many bike shops. We will work on anything, and we treat every customer with the same respect. A tune-up should be performed annually to maintain optimal performance. Dirty or corroded cables can make shifting erratic and braking difficult. This package is a great value if you want your bike ready to ride for the year! Chain, cables, and pivot points lubricated. The comprehensive tune-up is the best way to get your bike in perfect shape. A comprehensive tune-up includes everything a basic tune-up does, as well as cleaning the drivetrain. A dirty chain and gears will reduce pedaling efficiency. We remove and clean the entire drivetrain thoroughly. The bike will look and feel like new! A complete overhaul tears the bicycle down to the frame. The hubs, headset, and bottom bracket are repacked with grease. Think of it as an oil change for your bearings. The bike is brought back to like-new condition. A complete overhaul is obviously a great idea for a bike which has high mileage. However, a bike which has been in the basement for several years is also a great candidate for a complete overhaul. The grease in the bearings congeals and becomes hard when a bicycle is not used. More expensive repairs can be required if the ball bearings are not repacked with fresh grease on a regular basis. This is the same as the Complete Overhaul, except that every nut and bolt is removed, cleaned, and greased. This is the most complete overhaul.